One of my favorite things about what I do is the fact that I get to build relationships with so many people in our community. Yes, I share events and businesses, but it becomes so much more with each interaction; us often becoming friends, and that is what happened with Evening in the Orchard. 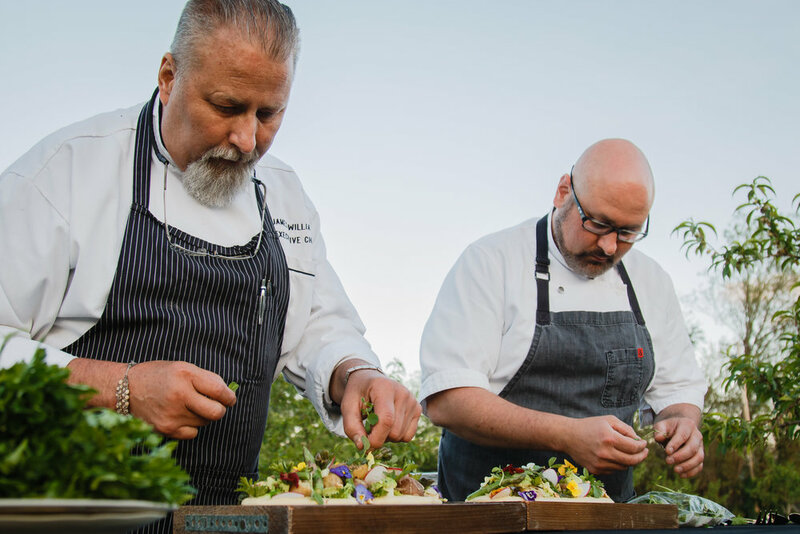 Whites Country Farm has now expanded into hosting special events beyond their annual Harvest Festival including, private dinners on the farm, weddings, and baby showers. At the Evening in the Orchard the businesses that came together were a mix of people that truly hold community love in their hearts. Our host, Whites Country Farm, is managed by Shannon Holt. Shannon loves southern Oregon and has been working hard to bring Whites Country Farm back to its glory days when it held small-town events, keeping the country feel in a suburban setting. The peach orchard was the perfect backdrop for the evening giving us a sense of enchantment and solitude while being right on the outskirts of Medford and Jacksonville. 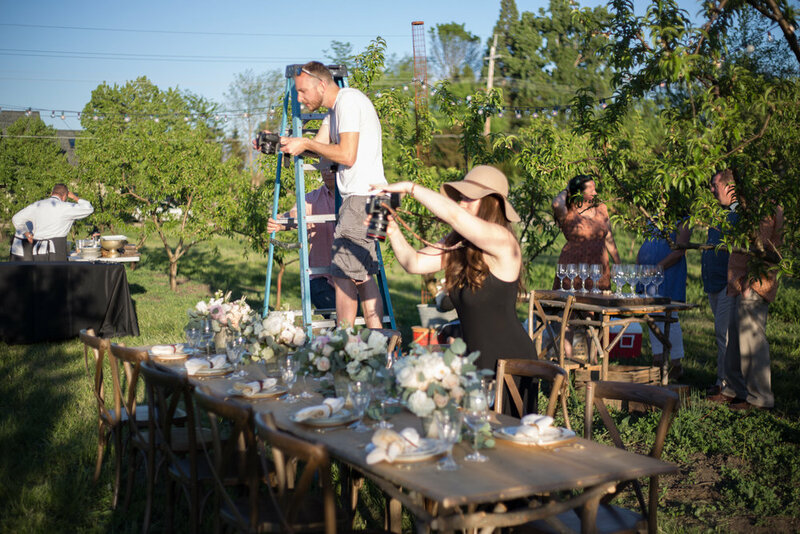 We really felt like we were in another world dining on some of the finest farm to table eats around which leads me to our beautiful table setting. When I contacted Shelly and Ron of On The Side Events and owners of the COOP de Ville they happily accepted the challenge and boy did they deliver. I met with them to talk about the evening, telling them my vision and Ron jumped right in with thoughts of castles in the sky and cotton candy dreams. No, but really Ron made my vision come to life down to the finest details. We went around their warehouse picking out each glass, table setting, and centerpiece. Shelly and I had to bring him back down to earth a bit here and there, but if you have a dream they will make it a reality. I truly enjoyed their back and forth as a couple and business partners as they formulated the perfect tablescape making contact with Penny and Lulu for the perfect flowers to complete the whimsy of the centerpieces and adding the pop of life that it needed. If you have never been into Penny and Lulu, you must. Cozied into a stone cottage in the middle of the hustle and bustle of west Medford you walk into a one of a kind floral paradise that contains every type of exotic flower of the season. The artists are no nonsense and will create you a unique arrangement that will woo the toughest critic. 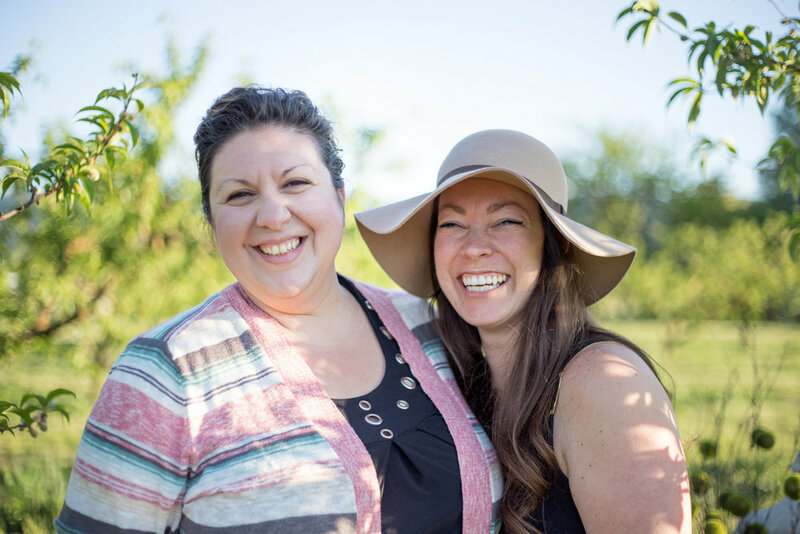 If you get the privilege of meeting the owners Suzie and Carol you will be won over by their genuine, straight forward love for our community. Which leads me to the food. Oh. My. Goodness. 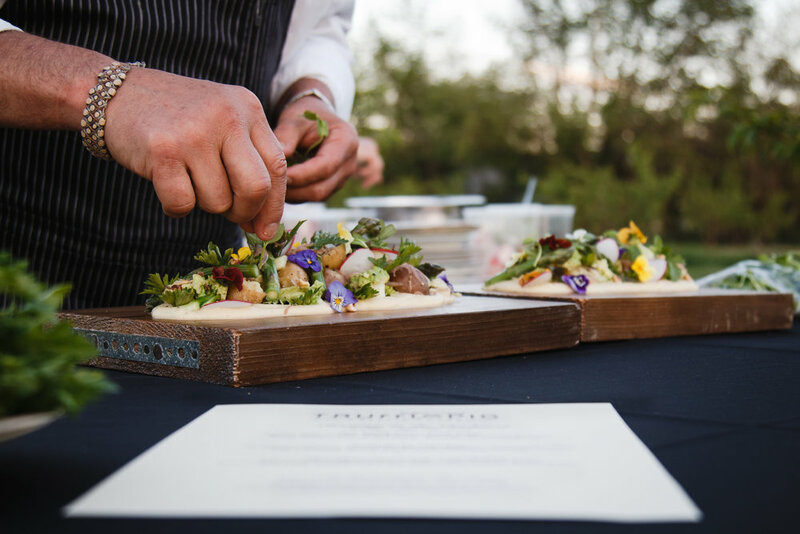 I had been following Truffle Pig Craft Kitchen since they popped on Instagram back in October of 2017 and I would be drooling over every picture they posted; the food sounded fabulous and the presentation was impeccable. I had to have to have them at this dinner and they exceeded our expectations beyond our wildest dreams. Chefs Skyler Golden and James Williams attention to detail made you want to take in the beautiful art presented before you took one bite. The food was brilliant and the service was wonderful by Shawna Williams! They locally source their produce and meat bringing you a truly local, culinary experience. The salad was light and delicious with a fresh, tangy dressing, a perfect palate cleanser to start our meal and paired up with a beautiful, light Grenache Blanc from Awen Wines. Second course was a creamy and decadent potato mélange topped with garden-fresh vegetables form Fry Family Farm, crunchy hazelnuts, and preserved lemon soubise. I think it was my favorite dish; I could eat it every day! To finish we had Olive Oil Poached Pacific Coast Halibut with wild Oregon fiddlehead ferns, lima beans, sweet potato puree, pickled green strawberry and yuzu-thyme brown butter. You can find them at the local growers market, Roxy Ann Winery on Friday's and local special events. They also will hire out for any special event, including weddings, baby showers, or anything you may need. They will put that special touch on any occasion. 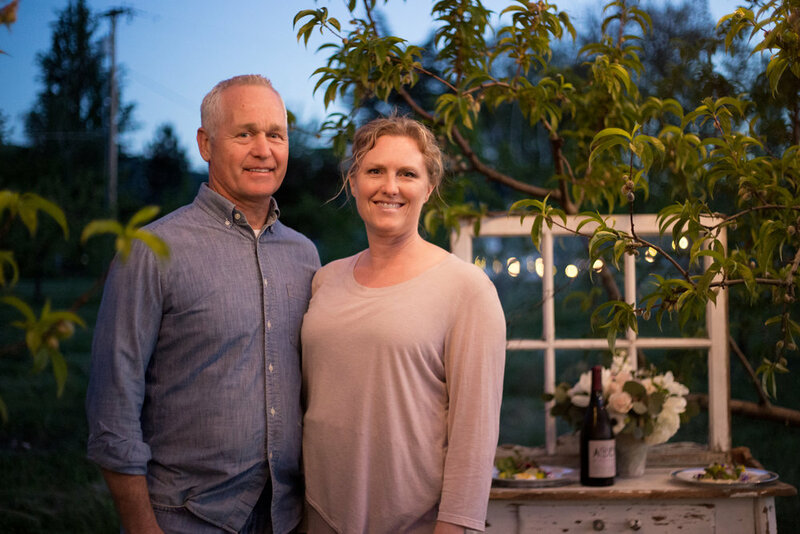 As I have already mentioned the wonderful Awen Wines, they are one of the newest winemakers on the southern Oregon wine scene. Winemakers Sean Hopkins and Tom Homewood have created 8 different white wines and one red. Their wines are complex, and balanced, and yummy (technical wine tasting term), but beyond the wine they are awesome, genuine people. Sean always has a smile on his face and is ready for a great conversation. Tom is fun and quirky and so very kind: accompanied by their beautiful and friendly wives Sarah and Natasha who also can give you every detail on their wines. Find their wine at Old 99, Cartwright's and special events throughout the year with their micro-tasting room opening soon (stay tuned on their Facebook page). Last but not least were our photographers and videographer. Landin Season and Beyond the Gates were our amazing photographers catching every single moment. The artistry they used was amazing and they moved around us so that we barely knew that they were there. Morgan Media Freelancing created this amazing video that captured the beauty of the spring evening perfectly. Unfortunately Landin Season has decided to focus on their family so they are no longer in business but Beyond the Gates is thriving in her wonderful business. If you are looking for the perfect event I would highly suggest working with all of these wonderful businesses. How lucky are we to have so many amazing people that put their heart into every event?! We came away from the evening with full bellies, inspired hearts, and lifelong friends. See the whole gallery of photos for Landin Season HERE and Beyond the Garden Gates HERE. Morgan Media Freelancing’s video can be found HERE.